We have carried the Godfather automatic knives for quite some time now. I was excited to see our supplier offer another variation on this knife. We just got them into stock. This auto knife has good action and looks a whole lot like an Italian stiletto knife. The new edition has faux stag horn handles. The blade pops open when you push the large button in the middle of the handle. 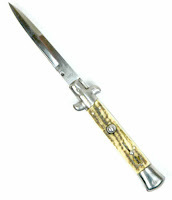 The stainless steel blade is made of 440 steel and is a bayonet style. To close the blade, you push the upper tang on the upper bolster to the left–it swings across and releases the blade so you can push it back into the closed position. Auto open, manual close. The safety is a slide on the front of the handle.